I think this is the final post from our Portugal trip. Hooray! 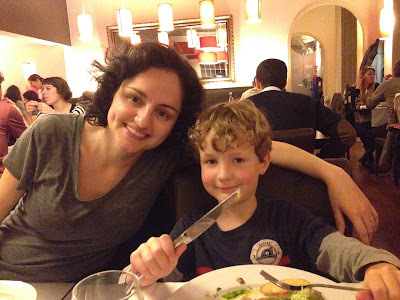 I don't often give restaurant recommendations on this blog, but since we did the best we could to sample as many classic Portuguese dishes as possible on this trip, I figure I might as well let you know where we went. We used a combination of advice from Pete's colleague who grew up there, our Airbnb host, and Tripadvisor. Also it should be noted that we are budget diners! I would recommend any of the places we tried. The first night we went to the "second best" vegetarian restaurant in Porto, according to our Airbnb host - Essência. It was really yummy, great atmosphere and reasonably priced; we would have gone back had we had time. Of course seafood is the primary fare, and our first taste was at Restaurante Casarão just down the road from our flat. We had a giant bowl of seafood rice with lots of whole sea creatures. 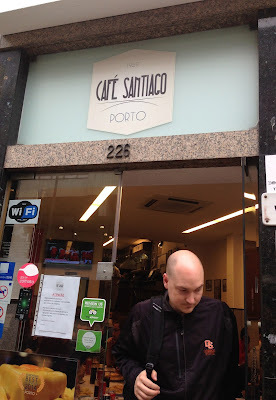 And we went back later in the week for the iconic Portuguese food - bacalhau - dried salted cod. We also couldn't leave Portugal without trying the slightly terrifying Frencesinha sandwich, which originated in Porto. For this heart-attack special, we went to Café Santiago. And we also visited a little pizza place on the beach south of our flat that was recommended by our host, Ciao Bella. 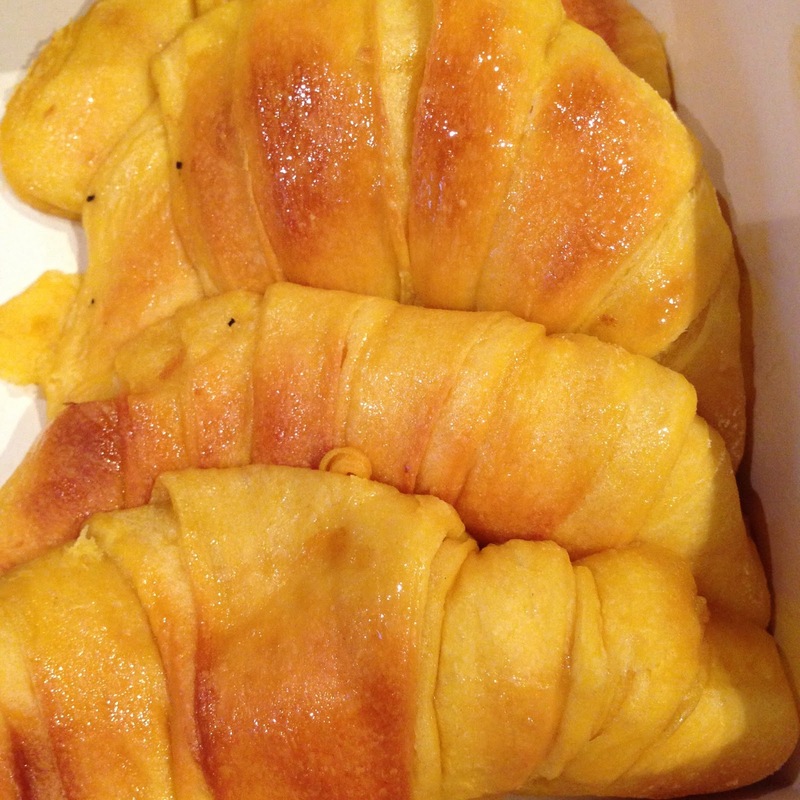 And speaking of bread, we tried the Portuguese version of a croissant - buttery, soft, sweet, sticky and delicious. 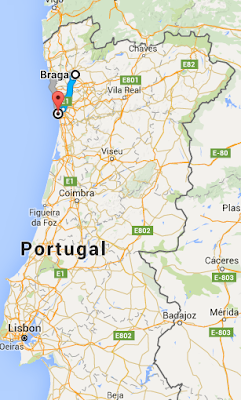 So that's it for Portugal! Yep, still Portugal. I'm behind. We don't really even still look like what we look like in these photos from November - hair grown or cut, baby teeth and/or fat lost, etc. I best get crackin'! Two posts to go. Braga was a side trip we took on our last full day in Portugal, just under an hour drive from Porto. Specifically, we visited a church at the top of a hill overlooking the city. It's called the Bom Jesus do Monte. Great name. The grounds around the church were fun to explore. I didn't get any good photos of the inside, but the organist was playing a Coldplay song, which we thought an odd choice. But a few minutes later a wedding party showed up, so he must have been practicing. We then made our way down the baroque stairway (which you can see quite well in the first photo of the post). Then we continued down the hill, interspersed with more steps and several small huts depicting the various stages of Christ's journey to the cross. Technically you're supposed to make this pilgrimage from the bottom to the top of the hill, so we got the events in reverse order. And then there's a funicular to take you back up if you've done the lazy version of the pilgrimage, or down if you've worked for it. Bom Jesus was an enjoyable (and free, save the funicular) outing in northern Portugal.